The school is very good, teachers are very supporting. I am full satisfied with the school. Best school for kids. cooperative staff and nice environment for the child development.methodology towords pre -school teaching is good and satisfactory. Very nice. I am satisfied. 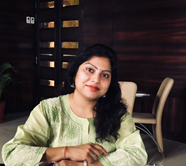 I am Megha Jain, Centre Director of Footprints Childcare, Indira Nagar, Lucknow. I am a mother of two grown up children. I really love children that is the reason I am into it. Our curriculum and way of teaching differentiate us from others. Our hands-on experience concept makes child learning easy and help kids to become smarter. We strongly believe that every child is naturally curious, enthusiastic, ambitious, creative and eager to acquire new experiences and knowledge. It is our responsibility as educators to foster these feelings and in doing so, to provide an educational experience to maximize each child’s potential. Education : M.Phil (ELT), M.A. (English),B.A and B.ED,N.T.T. Computer : Diploma in computer software and management. Experience : 7 years experience of teaching in RITM, 2 years experience of school teaching.